Physicists on the MicroBooNE collaboration at the Department of Energy’s Fermilab have produced their first collection of science results. Roxanne Guenette of Harvard University presented the results on behalf of the collaboration at the international Neutrino 2018 conference in Germany. The measurements are of three independent quantities that describe neutrino interactions with argon atoms, which make up the 170 tons of total target material used for neutrino collisions inside the MicroBooNE detector. MicroBooNE started operations in the fall of 2015. The detector, about the size of a school bus, has recorded hundreds of thousands of neutrino-argon collisions since then. It features a time projection chamber with three wire planes that record the particle tracks created by those collisions, similar to a digital camera recording images of fireworks. The Booster particle accelerator at Fermilab is used to create the muon neutrino beam for the experiment. It is the first low-energy neutrino experiment to make detailed observations of the subatomic processes that happen when a muon neutrino hits and interacts with an argon atom, leading to showers of secondary particles including protons, pions, muons and more. 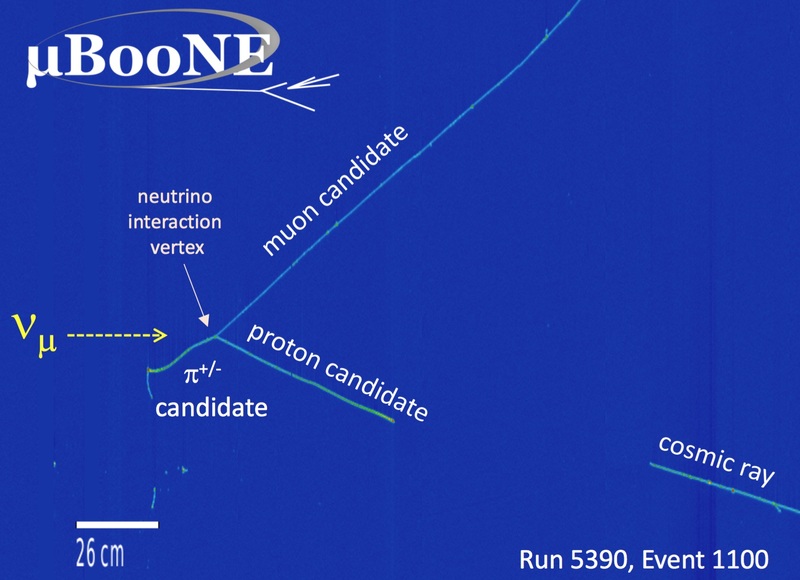 Using noise-reducing analysis techniques, MicroBooNE scientists can interpret the precise images of the particle tracks. One of the new results reported at the Neutrino 2018 conference was the first measurement of the multiplicity – or number of particles – that these neutrino-argon collisions generate. A new paper describing these results was submitted to the journal Physical Review D last week. Other measurements determined the likelihood, or more precisely the cross section, of a neutrino-argon collision occurring and producing a neutral pion or a more inclusive final state. The new results are of great importance for the groundbreaking measurements to be performed by neutrino experiments with liquid-argon TPCs. This includes the search for a fourth type of neutrino with the Short-Baseline Neutrino program at Fermilab, which comprises three neutrino detectors: the ICARUS detector, built by Italy’s INFN, refurbished at CERN, and then shipped to Fermilab in 2017; the new Short Baseline Near Detector; and MicroBooNE. The measurements are also important for the international Deep Underground Neutrino Experiment hosted by Fermilab, which will use both neutrino and antineutrino collisions with argon to search for differences between neutrino and antineutrino interactions, with the goal of understanding what role neutrinos played in the evolution of the universe. Nearly 200 scientists from 31 institutions in Israel, Switzerland, Turkey, the United Kingdom and the United States are members of the MicroBooNE collaboration. The experiment is funded by the U.S. Department of Energy Office of Science.